Reptile Rebates inside up to $99! 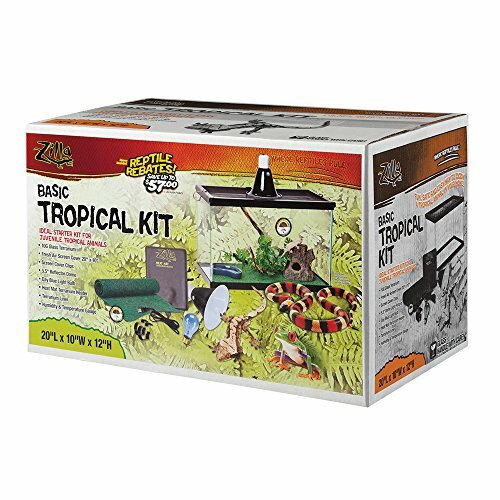 The size ten Tropical Starter Kit makes an ideal beginning habitat for tropical-dwelling reptiles. Each kit comes with a Reflective Dome light fixture that provides both light to keep your animal healthy. A Day Blue Incandescent bulb is also included for necessary daytime basking and a heat mat that provided low, constant heat. The Screen Cover will keep your critter safe and secure inside their home. The Humidity/Temperature Gauge allows for a quick and easy read on the environment parameters to ensure they are at the right levels. Consult a Zilla Habitat guide to see what your particular animal requires. The Green Terrarium Liner is a low maintenance, odor-fighting carpet substrate that cannot be digested and is non-abrasive. Also included is an easy terrarium setup guide that will quickly get you on your way – all that you need to get started! *Does not include UVB lighting which may be required for some reptiles.